Located on the first floor of the building and accessed from the original, sweeping, Victorian staircase, this well-proportioned apartment has a welcoming entrance hall which leads to a fantastic open plan, oak floored, kitchen/lounge providing you with all you need for a self-catering holiday: fridge freezer, washer/dryer, microwave, dishwasher, hob, oven and much more. The dining area and lounge, boasting a full height bay window with side view aspect, has two, large comfortable sofas allowing you to relax watching TV after a hard day’s sightseeing. Further down the hallway you will find the stylish, tiled bathroom with WC , hand basin and over bath shower. Located at the rear of the property, the master King size bedroom has ample wardrobe space and benefits from a tiled en-suite with shower, WC and wash hand basin. The second double bedroom, which is also located at the rear of the property is ,again ,fitted with a wall of built in wardrobes . Guests always comment on how quiet and peaceful the bedrooms are ensuring you of a good night's sleep during your stay. High quality bed linen and towels are provided for you during your stay and you will find the apartment all made up and ready for you on arrival. A small welcome pack of fresh flowers, tea, coffee, milk and biscuits is also provided . A travel cot and high chair are available on request.. Located on the first floor of the building and accessed from the original, sweeping, Victorian staircase, this well-proportioned apartment has a welcoming entrance hall which leads to a fantastic open plan, oak floored, kitchen/lounge providing you with all you need for a self-catering holiday: fridge freezer, washer/dryer, microwave, dishwasher, hob, oven and much more. The dining area and lounge, boasting a full height bay window with side view aspect, has two, large comfortable sofas allowing you to relax watching TV after a hard day’s sightseeing. Further down the hallway you will find the stylish, tiled bathroom with WC , hand basin and over bath shower. Located at the rear of the property, the master King size bedroom has ample wardrobe space and benefits from a tiled en-suite with shower, WC and wash hand basin. The second double bedroom, which is also located at the rear of the property is ,again ,fitted with a wall of built in wardrobes . High quality bed linen and towels are provided for you during your stay and you will find the apartment all made up and ready for you on arrival. A small welcome pack of fresh flowers, tea, coffee, milk and biscuits is also provided . A travel cot and high chair can also be provided. We have stayed in this property of a number of occasions when working at the university. 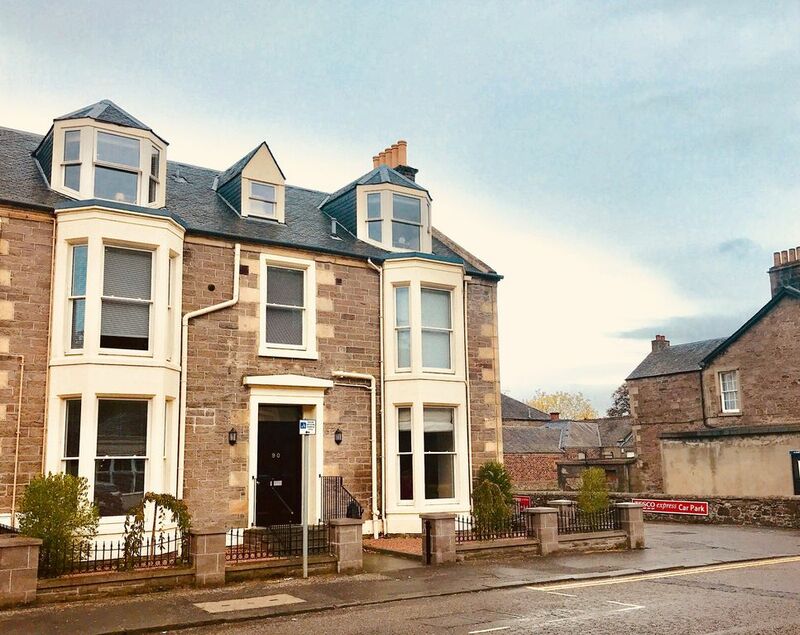 It's a real 'home from home' in a great location close to the bars and restaurants in the Bridge of Allan and right next door to a Tesco Express for anything that you might need to buy. It's immaculately clean, very comfortable and has everything you need to make your stay as easy as possible. With 2 bedrooms and 2 bathrooms its ideal for 2 couples or as, we are, 2 business colleagues who would rather stay in somewhere where can relax rather than in a hotel. This apartment is well placed and appointed to create a fabulous base for a good time. Feel lucky to have found such a home from home. We will return when we visit our son at Stirling Uni. This is a roomy, clean and well appointed apartment in a great location. We had a really good stay and will return. The directions were perfect, as was the support from Stirling Self-Catering before and during our stay. The apartment is centrally located, with one supermarket next door and another just two minutes away. Bus stops are equally close; the train station is at an 8-10 minutes‘ walk. The apartment is large, with two bedrooms, two bathrooms, a lounge, a well-equipped kitchen, and enough storage space. And it is quiet, despite being on the A9. – One problem we faced was how to keep it cool (this was the sunny summer of 2018) and how to get fresh air in. The curtains in the (westward-facing) lounge refuse to be drawn; all we could do was use a clamp halfway down. Also, the only window that can be opened more than 10 cm is that in the second bedroom. However, on the whole, we were very happy here and this apartment will be our first choice if we go back to Bridge of Allan. Apartment was clean modern spacious and quiet with everything provided for the stay. The apartment has 2 bathrooms which was very welcome and the kitchen facilities were very good. The apartment is very centrally located for visiting many places of interest and Bridge of Allan itself has many varied shops on offer. All in all we had a an excellent stay in Walmer apartment. A wonderful apartment in a very nice village. Clean, roomy, modern and well equipped. We loved the highland cow pictures above the beds. It was a convenient place to stay with easy train access to Edinburgh. We loved the village and the Tesco Express next door. Walmer Apartment, located within the historic Victorian Spa town of Bridge of Allan, is in an ideal location to explore the local area, one which combines both outstanding natural beauty with a unique local history. Within a short driving distance you will also be able to sample Scotland’s magnificent Highland scenery and hospitality before returning home to the comfort of your accommodation.